The Star Traveler--Victoria Houseman--Haley Stone grieves for her mother and a reminder about tales of the Blue moon take her outside one night to make a wish. Donovan de Lyon is from a long line of Star Travelers, a race dedicated to fulfilling wishes of happiness across the universe. Though he will take over as Master Star Traveler soon, he thinks only to make his family happy even though it is not his wish. 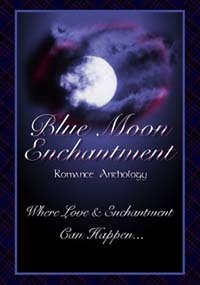 With Earth's Blue Moon coming, he's off to fulfill wishes there and hears Haley's. In fulfilling his duties, will Donovan find his own happiness with a giving and beautiful woman? 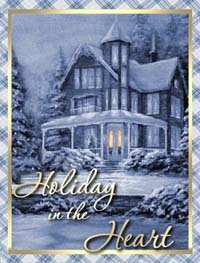 Ms. Houseman's tale of love transcending the stars is one to cherish in this wonderful collection of stories. The concept behind her view of the Blue Moon is refreshingly unique and filled with an interesting race of people that I would love to hear more about. 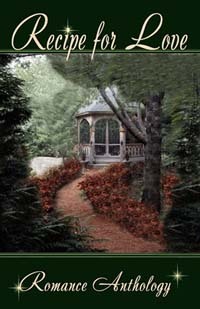 RACHEL'S LIGHT by Victoria Houseman - As governess to Samuel Stein's children Rachel Levine knew her place yet couldn't help but wish to take away the pain and bitterness she saw in Samuel's beautiful eyes. Samuel was bitter over what life had dealt him after losing his wife and the pain from his mangled l eg but most of all hated that he hurt Rachel with his drunken tirades, a lovely gentle young woman who deserved better. *** Houseman writes a powerfully beautiful love story of redemption as a gentle young woman brings light and promise to man who once thought his life bleak. I really love the idea behind this book--that is the old cliche of "the way to a man's heart is through his stomach!" While we may smile at the old-fashioned wisdom of it, I would bet that most women might secretly agree! Though I really enjoyed many of the stories in this book, my favorite had to be Victoria Houseman's, "The Pumpkin Pie Murder." I especially loved that this story was set in the gracious environs of Charleston, SC, where we find our murder committed in a bakery. Sara Stone, gutsy detective, & our hero, Silas Edwards, sweet shop owner & baker, meet at the scene of the crime where a wealthy man (wanted by the NYPD) is executed while eating a slice of pumpkin pie. Silas is upset & furious that the crime has happened in his place of business, with a patron he liked. Sara is passionate about her career due to the motivation of her brother's abduction years before. Silas grew up learning baking from his Grandmother, his guardian, after his parents were killed in an auto accident.They are both pretty "closed-in" people due to the tragedies of their past. Despite their instant mutual attraction, neither seems willing to make the first move to get together. Silas has a rep around town as the gorgeous baker who is quite the run-around, and Sara wants no part of that scenario. Finally, Sarah's sister takes matters in her own hands & sets up an "accidental" meeting between the two. Barriers fall, & this couple finally admits they are falling in love. I really appreciated Houseman's skill at introducing her characters as people whose past clearly motivates their actions in their later lives, and she gives us reasons to appreciate these characters as people. For instance: Silas is pictured as the gadabout around town, but we see by his actions of his protectiveness to his sister, as well as his caring about his patrons (he always made sure his regulars had the "treats" they wanted on hand when they visited his establishment) that Silas was a caring & concerned man. I will look forward to reading more of this talented author's works in the future.